At the end of the year 2015 the European common migration policy has been dominated by the stiff conviction that, in order to solve the so called “migration crisis”, the Union should prevent them from crossing the European borders. From this perspective, the agreement signed last November 29th 2015 between the European Union and Turkey, seems merely the natural outcome of this common feeling of scepticism towards the massive amount of people fleeing wars, conflicts and extreme poverty. With a simple and yet true metaphor, if Erdogan’s Turkey is a bottleneck through which most asylum seekers originating from Syria, Iraq, Afghanistan and Iran transit to then move on to Europe, there could be no better solution than sealing it with a solid cap. As laid out in the agreement, the European Commission strengthened the European financial support to Turkey for the management of the massive flow of asylum seekers gathering in the country (for an initial amount of 3 billion euros), with the declared request that such funding would curb the arrivals in the European countries. 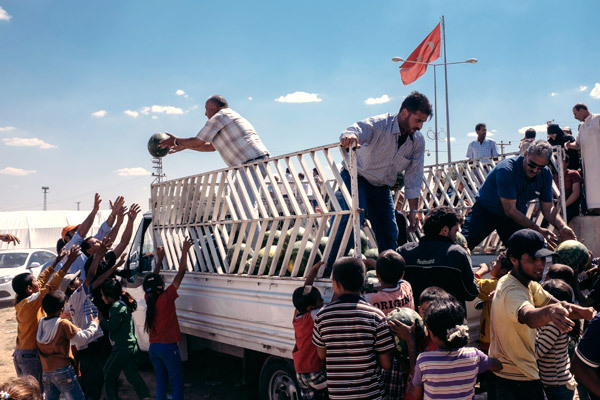 However, whether Turkey is the right country to shelter a swiftly growing number of asylum seekers or not is still under the scrutiny of many international NGOs and Think Tanks. On December 14th 2015, Amnesty International published a report on the subject, called “Europe’s Gatekeeper: Unlawful detention and deportation of refugees from Turkey”. The briefing was drafted on a research conducted during the period from October to December 2015, and was accomplished thanks to face-to-face and telephone interviews with more than 50 refugees and asylum seekers who had been detained and some of whom had been deported from Turkey, and with the help of civil society organizations and international organizations working within the Turkish territory. Under Turkish law, foreign nationals can be held in administrative detention under specific circumstances. However, according to the study, the conditions and the target of the detention practiced by the Turkish government towards the asylum seekers might not be law abiding. First of all, several detainees are Syrian nationals, who flee the war in their country of origin and for this reason are granted by the Turkish State a Temporary Protection Status on a group basis; therefore, there would be no legal ground to detain Syrian asylum seekers. Furthermore, a very important feature of the detention of asylum seekers in Turkey is that it is in most cases arbitrary and therefore unlawful: detainees are denied the right to know the reason(s) for their detention and enjoy the normal procedure of detention, with its complete set of rights. In fact, Amnesty International reports that this detention of asylum seekers is usually also incommunicado, meaning that the detainees are not granted the right to communicate with their relatives and their lawyers, and are deprived of all kinds of communication device. To be sure, this condition violates the international law as well as the Turkish law, which stipulates that family members and lawyers must be given access to detainees. The report mentions the story of a Syrian man interviewed who knew that his daughter had been detained in the Erzurum removal Centre and when he went to visit her, he was enigmatically welcomed with: “We can’t say she’s here and we can’t say she’s not here”. Amnesty International has also collected credible evidence of ill-treatment in detention, which could lead one to think that such practices are widespread in the asylum seekers detention facilities. The credible evidence collected by Amnesty International shows that many cases of detention of asylum seekers from Syria and Iraq ended with their removal from the country and deportation, in open violation of the principle of non-refoulement, which makes it impossible for persons to be returned to their country of origin when in this country their life would be at risk. During the last days of November, about 130 people where deported from the Erzurum Detention Centre alone. In the conclusion of the report, Amnesty International outlines a list of recommendations both for the European Union and for the Turkish government, strongly calling for a pledge from both sides to implement the new agreement in respect of human rights and refugee law.